Your browser does not support the video tag. 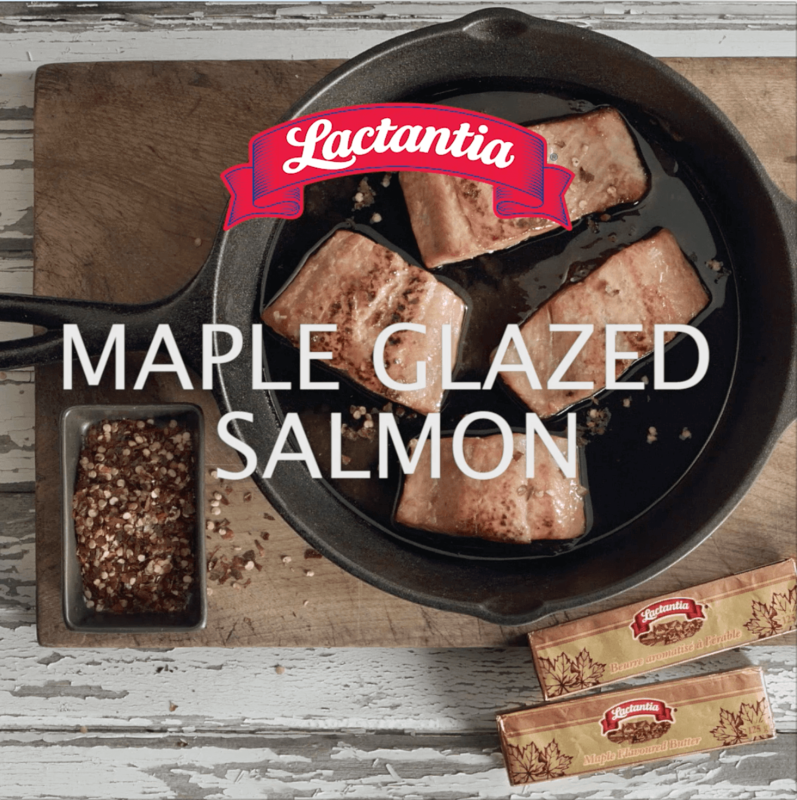 Ingredients ½ cup (125 ml) Lactantia® Maple Flavoured Butter 3 tbsp (45 ml) honey 4 6oz (175 g) salmon fillets, skin on Salt Instructions Preheat oven to broil on medium-high heat. In a 12-inch (30 cm) ovenproof skillet, place Lactantia® Maple flavoured butter and cook. Stir over medium heat until melted and slightly foamy. Add honey, stirring well to combine. Cook for one minute. Remove skillet from heat and pour half the butter mixture into a bowl; set aside. Place fillets skin side up in the skillet and sear for 3 minutes over medium-high heat. Carefully turn over fillets and place skillet in the oven. Broil for 4 to 6 minutes or until salmon is firm to the touch. To serve, drizzle with reserved butter and season with salt to taste. Tip: Add dried chili flakes for a sweet and spicy flavour. Preheat oven to broil on medium-high heat. In a 12-inch (30 cm) ovenproof skillet, place Lactantia® Maple flavoured butter and cook. Stir over medium heat until melted and slightly foamy. Add honey, stirring well to combine. Cook for one minute. Remove skillet from heat and pour half the butter mixture into a bowl; set aside. Place fillets skin side up in the skillet and sear for 3 minutes over medium-high heat. Carefully turn over fillets and place skillet in the oven. Broil for 4 to 6 minutes or until salmon is firm to the touch. To serve, drizzle with reserved butter and season with salt to taste.